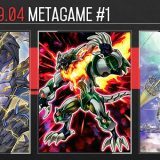 Welcome to Week #0 of the OCG 2018.10 format. 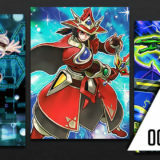 This preliminary report will cover 104 top-performing decks from 15 tournaments that were held in Japan and China during 22 – 30 September 2018, played under the new OCG 2018.10 Limit Regulation. 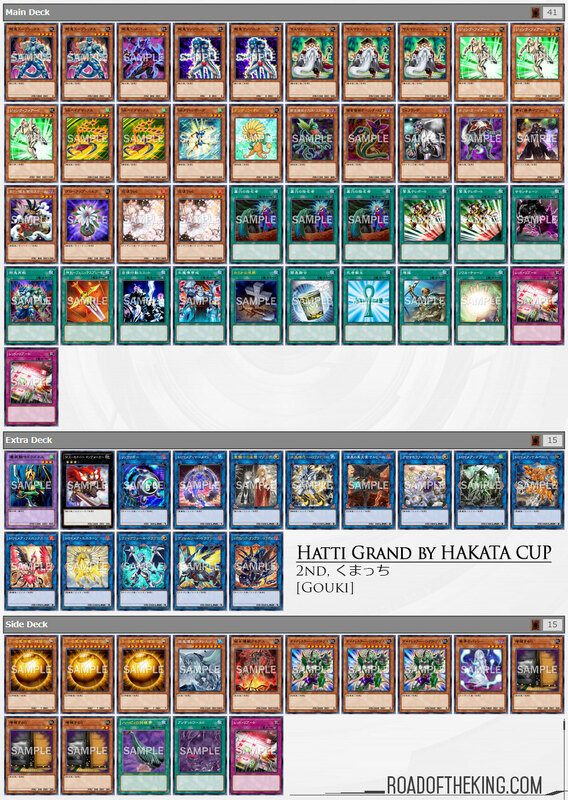 SIN went 7-1 and finished 1st in “Hatti Grand Challenge Cup in Fukuoka by HAKATA CUP”. 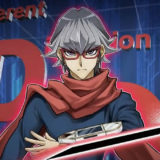 As both Sky Striker Mobilize – Engage! 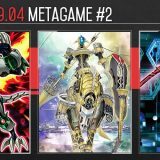 and Sky Striker Mecha – Widow Anchor became semi-limited in OCG 2018.10, most players simply replaced them with Upstart Goblin. SIN went a step further and cut Pot of Desires by returning to the old classic Foolish Burial Goods and Metalfoes Fusion. However, his build is still largely an outlier as most Sky Striker decks are running Pot of Desires for the card advantage. 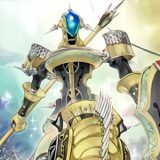 As Summon Sorceress became forbidden and A Hero Lives became limited in OCG 2018.10, running Destiny HERO – Malicious becomes much less consistent. Some Japanese players begun exploring a different Gouki build that relies on the Plant engine instead. 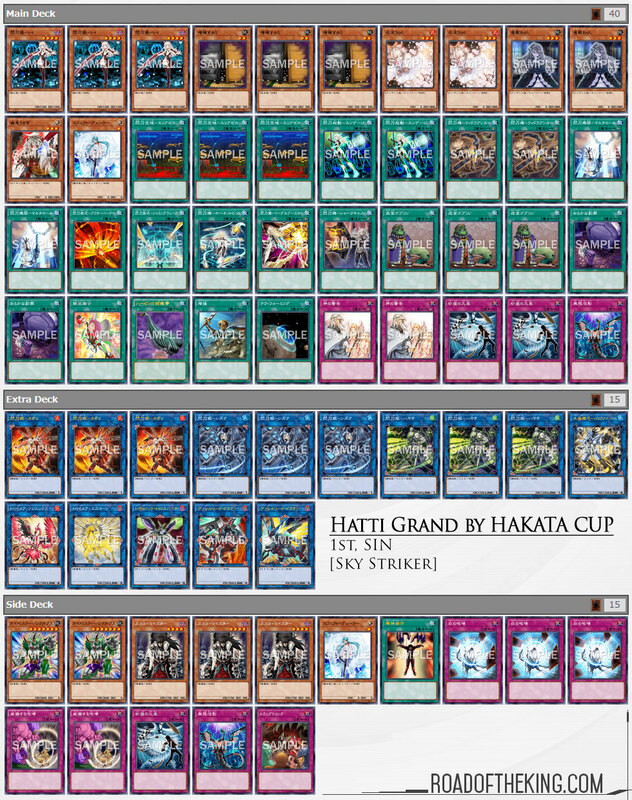 Kumatchi (くまっち) went 7-1 and finished 2nd in “Hatti Grand Challenge Cup in Fukuoka by HAKATA CUP”. 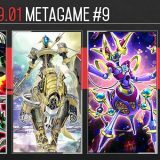 He is running the new variant of Gouki that cuts out Armageddon Knight and Destiny HERO – Malicious, to run Mathematician, Dandylion, Predaplant Ophrys Scorpio and Predaplant Darlingtonia Cobra instead. The new combo opens with Mathematician in the 3rd Main Monster Zone, to send Dandylion to the graveyard and Special Summon 2 “Fluff Tokens”. The 2 “Fluff Tokens” are then used to Link Summon Aromaseraphy Jasmine, whose effect will be activated to tribute Mathematician and Special Summon Predaplant Ophrys Scorpio. Predaplant Ophrys Scorpio will in turn Special Summon Predaplant Darlingtonia Cobra, whose effect will add Instant Fusion to hand. 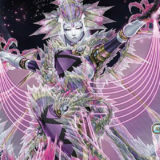 Both Predaplant Ophrys Scorpio and Predaplant Darlingtonia Cobra will then be used to Xyz Summon M-X-Saber Invoker. M-X-Saber Invoker will Special Summon Gouki Suprex and together they will be used to Link Summon Isolde, Two Tales of the Noble Knights. 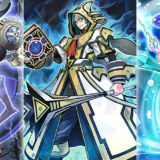 Gouki Suprex will search for a Gouki card, while Isolde will add Necro Gardna to hand, and then send Divine Sword – Phoenix Blade to the graveyard to Special Summon Gouki Octostretch. Following will be the usual Knightmare Link Monsters and Firewall Dragon shenanigans. 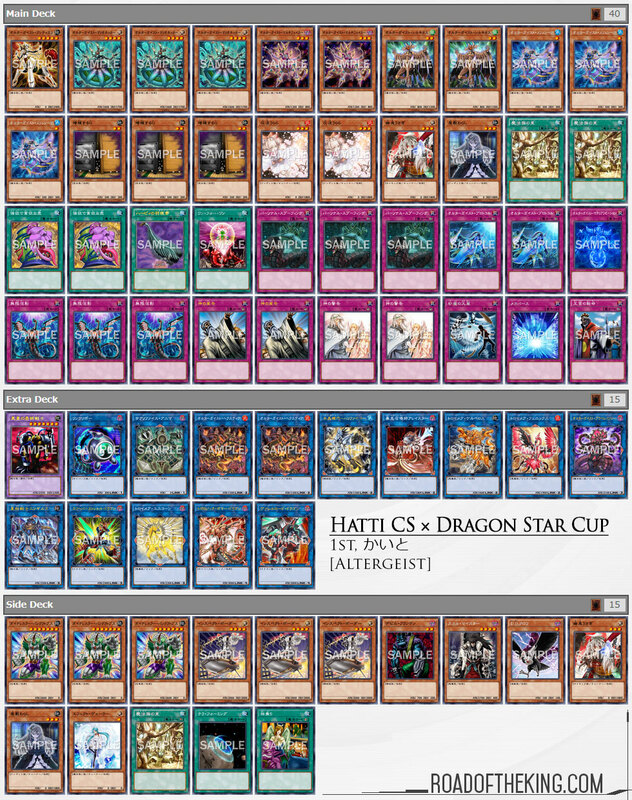 Kaito (かいと) went 7-1 (excluding 1-bye) and finished 1st in “Hatti CS × Dragon Star Cup in Dragon Star Kishiwada Haruki Shop” (Team 3v3) which had 40 teams (120 participants). He has a simple and straightforward strategy for the current metagame. Secret Village of the Spellcasters against Sky Striker. 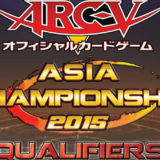 Inspector Boarder against Gouki and Good Stuff Link. Dinowrestler Pankratops and Inspector Boarder against Trickstar and Altergeist mirror match. 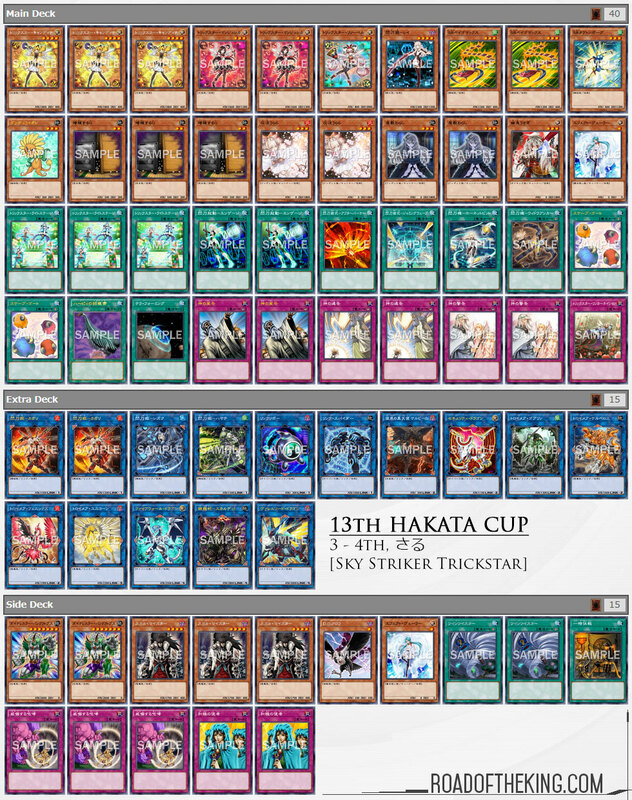 Saru (さる) went 6-0-1 to finished 3 – 4th in “13th HAKATA CUP with Hatti CS” on Saturday, and went 5-2 to finished 3 – 4th in “Hatti Grand Challenge Cup in Fukuoka by HAKATA CUP” on Sunday. He took out Ghost Ogre & Snow Rabbit to add another Effect Veiler in the Main Deck for his build on Sunday. 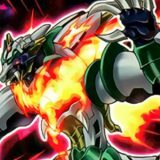 Speedroid is currently the most popular build for Trickstar, due to the explosive play from Cherubini, Black Angel of the Burning Abyss sending Dandylion. 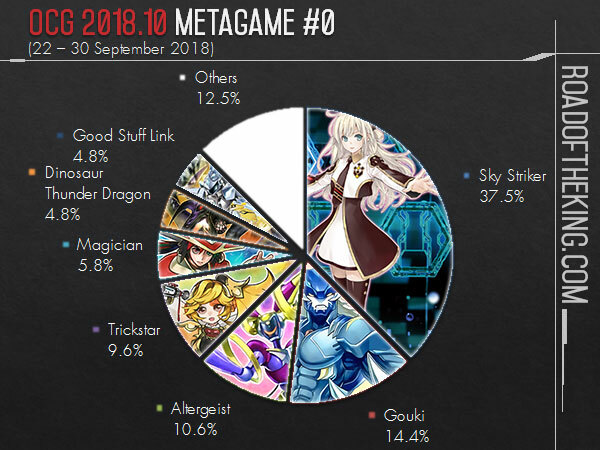 Sky Striker remains as the most popular and better performing deck in the early OCG 2018.10 format. Requiring only minor changes to the build, Sky Striker has largely reached its optimised build. Gouki is still being refined as we see a split between the traditional Malicious build and the new school Plant build. There are some hybrid variant that runs both Armageddon Knight and Mathematician together in the same deck to utilise both Malicious and Plant engine. 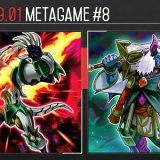 Altergeist has a weak start in the first week, but as the metagame stabilised in the second week, Altergeist begun putting out better results. Trickstar has a strong start in the first week, but declines in the second week. Based on the current trend, Trickstar is unlikely to remain as a top contender and is expected to occupy a smaller showing in the following weeks. 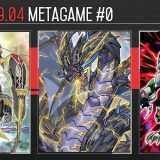 Dinosaur Thunder Dragon is a new interesting deck that is gaining a bit of traction. Is that Gouki deck running E-Tele and Dr. Frankenderp of all things just as a level 3 to make M-X-Saber Invoker? It makes Cherubini and Invoker, but yeah. I personally prefer not to use Derp and just use Ogre. That will change when SAST comes out though. I think Crusadia is a lot better than Predaplant. Crusadia Arboria will never be a dead-card in your hand, and the system takes up only 1 position in main deck and 2 positions in side deck. Combo: needlefibre ss Blackwing – Steam the Cloak from deck. 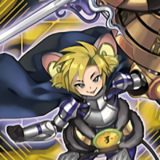 Link summon Crusadia Equimax, Steam ss 1 token. Equimax turns into Magius. Use the token to link summon Linkuriboh, Magius adds Arboria to hand. Steam tributes Linkutiboh and revives itself. SS Arboria to Magius point. Arboria and Steam makes a Cherubini, Black Angel of the Burning Abyss (Steam ss 1 token) and sends Dandylion to GY. Now you have enough resources for a FireWall combo. 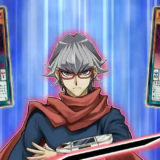 In brief, we want 6 link numbers on our field for a FireWall combo. I think Crusadia is more stable. What the meta beat ? please .